The word bong has Thai origins. It is derived from “baung” which means a water pipe used for smoking. Bongs are usually used to smoke tobacco. It is similar to a hookah, but it is smaller . It is like a tube . 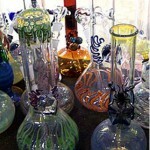 There are many kinds of bongs available in the market like glass bongs, water bongs, etc. A bong has a bowl where water is put and a stem for smoking. There is also a hole above the water level called a ‘carburetor to let in fresh air. This hole is closed when you intake and then opened. 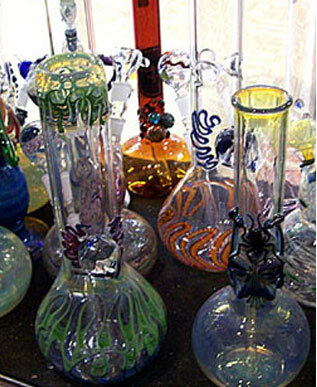 Bongs are popular because it is believed that smoking a bong is much safer than smoking marijuana cigarettes or pipes . As it filters the cannabis, it is considered to be a better method of smoking Using it also reduces the chances of burning your mouth. Hence it is quite popular. However in the United States it is not legal to sell or use bongs or any of the marijuana smoking accessories. Another popular way to smoke marijuana is to use a pipes. There are many kinds of pipes available- glass pipes, wooden pipes, metal pipes etc. These pipes are easily available in the market but it is advisable to avoid using cheap marijuana pipes. Before buying marijuana pipes you should know about its component parts . A marijuana pipe consists of a bowl ,a shank .a stem and mouth piece. You place the marijuana in the bowl and it is burned there. The shank is the neck of the pipe .The stem connects the shank and the mouthpiece. You place the mouthpiece on your lips and smoke. Even it is a cheap marijuana pipe make sure all its components parts are flawless. If your marijuana pipe has any defect ,then you will not be able to smoke properly. Glass pipes are the most common These pipes do not get hot even when used for a long stretch of time. It is due to the quality of the glass used. However be careful while handling these pipes because they are quite fragile. They are considered ton be better than metal or wooden pipes. Wooden pipes are popular too. They are same as the pipes used for smoking tobacco . These pipes have a large bowl and thus can hold more marijuana. Metal pipes come in great shapes and sizes. Some of them are so elegantly designed that they look like antique. Marijuana pipes are also available in different forms like chillum, bubbler pipes foldable pipes and one hitters. There are also vaporish which instead of burning the marijuana vaporize it. These are also pretty popular among marijuana users. This entry was posted on Monday, June 27th, 2011 at 21:56	and is filed under Marijuana Stuff. You can follow any comments to this entry through the RSS 2.0 feed. You can leave a comment, or trackback from your own site. In 1972 a special stone popped out of a gravel crusher I was working on. (nothing pops out of crushers) It is 3 1/3 lbs and has an hourglass hole through it. You can even toke in the shower with this Medicine stone. Nothing is more sacred in North American lore than stones. It’s great for nose hits and easy to pass around. The word bong has Thai origins? I didn’t know about the origins of marijuana but… does it means it’s from Thai? It’s so surprising. I guess I’ll do some researches.